My brother-in-law and I were in downtown Chicago with the rest of our family walking around," writes Doug Peek. "He had his Nikon and I was armed with my Canon." 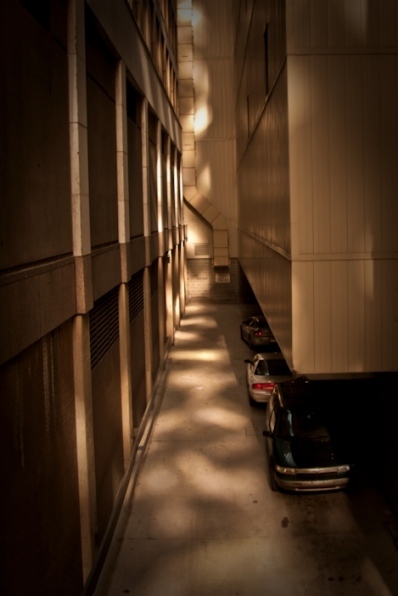 "We were exploring south on Michigan Avenue late in the afternoon when we passed by this alley. It had such a spectacular lighting pattern that I had to "grab" the shot. A slider here and a slider there in Lightroom, and this is the result." Thinking on it though, makes it even a more unusual image. The lighting pattern is from the sun reflecting off the mirrored glass from the building on the other side of Michigan Avenue. Not cool enough though. This pattern is unique in that it will only appear during a certain time of year. Sometimes you just have to take the shot when you see it." Photo by Doug Peek. Click on image for larger version. This is our 204th Grab Shot! Wow. If you want to review the collection that began back in 2006, go to our Grab Shots page.